Did you know that October is American Cheese Month? It’s also that time of year when it really starts to feel like autumn, and the harvest is in full swing. What better reason to celebrate with a massive platter of cheese that’s shockingly gorgeous and perfect for fall? Cheese boards are one of my favorite things to throw together for a party. My favorite part about them is how they can be customized to suit the season. It’s easy to create an elegant cheese plate at home by grabbing up a few key ingredients from your local market and following these four simple steps. For this Fall Harvest Cheese Board, I chose a Castello Blue Cheese and Aged Havarti – One is creamy and pungent, the only has a bit of a bite to it and a sharp flavor. Crackers or Bread. I love to serve up my cheeses with some artisanal crackers. Here I used Lesley Stowe Fig & Olive Raincoast Crisps, which I thought would tie in the figs and olives featured on my platter nicely. Fresh Fruit. Grab whatever looks great from your local market. During the fall season, you’ll find some spectacular pears, figs, apples, grapes. Charcuterie. Thinly sliced prosciutto and salami were my meats of choice here. Olives. Head to the olive bar at your local market and take your pick – Kalamata and Castelvetrano olives are two of my favorites. Nuts. Walnuts, hazelnuts, pistachios, Marcona almonds, even candied nuts. Pumpkin seeds would also make a nice accompaniment. Honey. Honey pairs so well with fresh cheese. Try it with soft goat cheese or pungent blue cheese. Grab a big board or platter and start arranging. I like to place my cheeses first and then I’ll gather some greenery like apple leaves, orange leaves, dried corn husks, fresh herbs (I used sage here) and edible flowers. 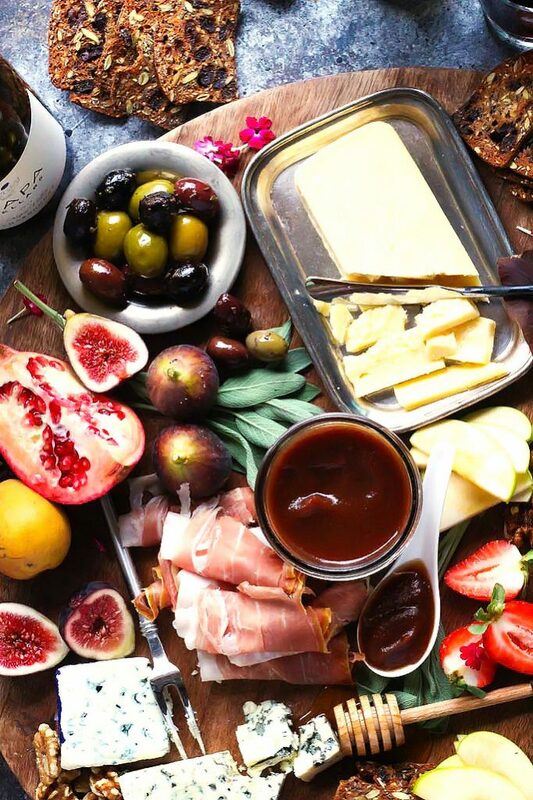 Slice up some of the fruit and arrange them on your platter along with the charcuterie, small dishes of olives, and your honey and apple butter spread. Be sure to have separate serving utensils for each of the cheeses and spreads, as well as a small dish for olive pits. Choose two or three different types of wine, based on the number of cheeses you choose. 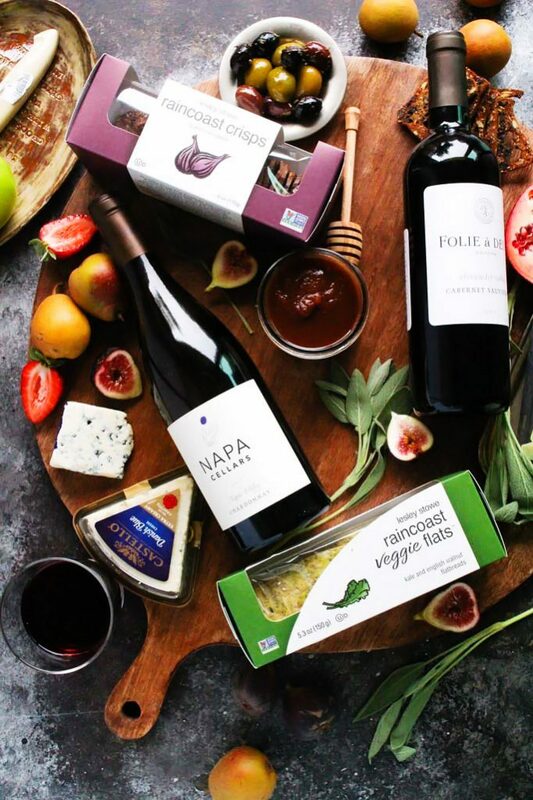 Some of my favorite wines for pairing with cheese are Cabernet Sauvignon, Zinfandel, Pinot Noir, Merlot, Chardonnay and Sauvignon Blanc. For this particular platter, I chose a Folie à Deux Sonoma Coast Pinot Noir ($20) and a Napa Cellars Chardonnay ($22). Enjoy! 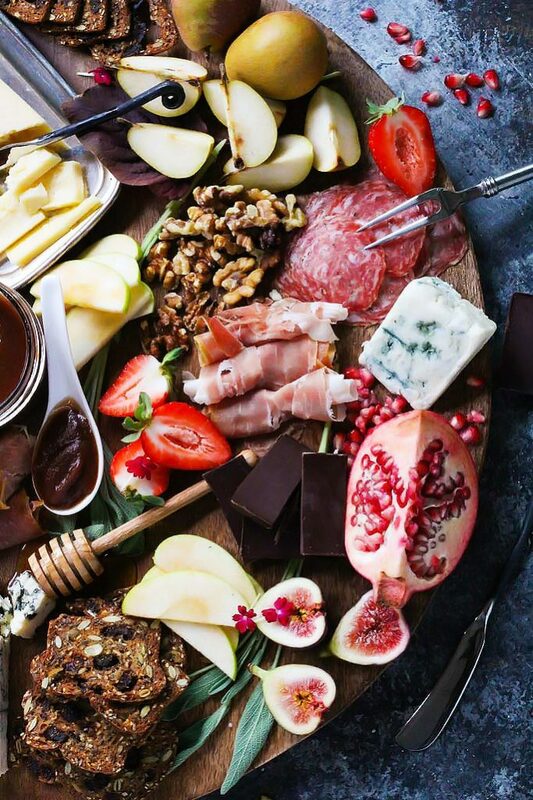 One of the key benefits to serving a cheese plate is that all your work can be done ahead of time, leaving you free to spend time with your guests. This delicious Apple Butter is a perfect compliment to the Perfect Fall Harvest Cheese Board. It's easy to make with the help of your slow cooker. Place apples in slow cooker. Add the remaining ingredients and stir until evenly mixed. Cook on low for 12 hours, stirring and breaking up the apples occasionally. Remove cover and use a blender to puree the apple butter until smooth. If you would like a thicker apple butter, return the mixture to the slow cooker and cook on low, with the lid ajar, until the desired consistency is reached. Allow the mixture to cook and then transfer to jars. It will store in the refrigerator for up to 2 weeks, or can be stored in the freezer for up to 3 months. I love a recipe that is delicious, goes with cheese, and scents your house better than air freshener or a candle! I love cheese boards because they’re a huge crowd pleaser yet they’re super simple to prepare. I had never thought to add leaves or other garnishes for decoration, though. Next time I will! 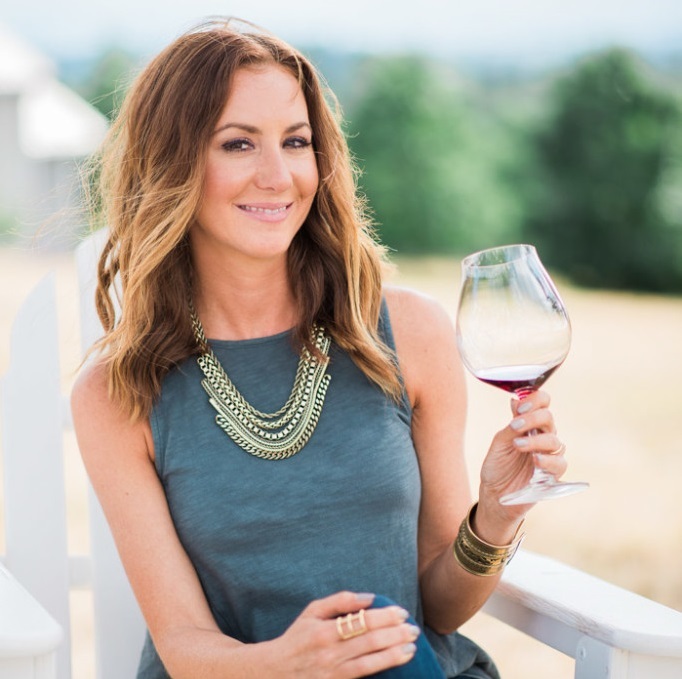 I totally agree Catherine – It’s such an easy, fuss-free way to throw together a party appetizer. Oh my goodness woman! this harvest plate is beautiful! 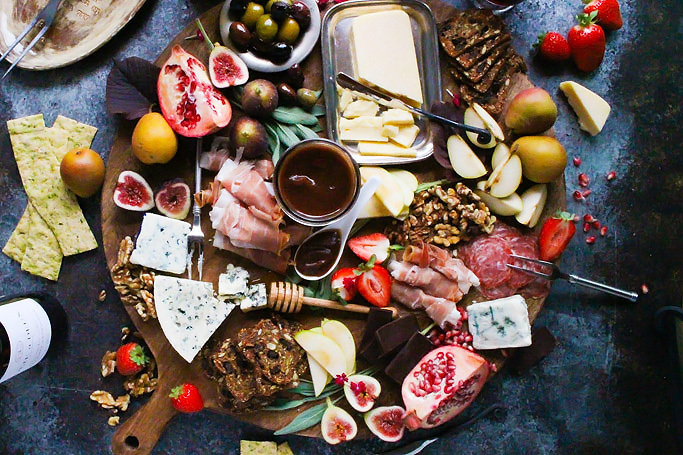 This really is the most perfect fall cheeseboard, holy crap!!! You’re giving me so much food styling inspo here Erin (not that I’m surprised)! Yum. This cheese board is so complete. It looks so delicious! I love cheese boards! Such a great people pleaser and so simple to make. I love the idea of adding leaves and other garnishes! Great job! This is really beautiful AND delicious! Cheese boards are great for entertaining but they do not always look as pretty as this one. Great job on complimenting flavors and adding some class.